A breakthrough got Tsipras – but for how long? Greek Prime minister Alexis Tsipras got Syriza’s approval to reach a bailout deal with the country’s creditors. As the Financial Times reports, he managed to overcome the objections of his leftist party’s most extreme fringe. Government officials in Greece are saying they hope to reach an agreement by the end of the week. But the two sides are still far apart on issues Mr Tsipras calls “red lines we cannot cross”, including pension reforms and increases in value-added tax, according to several people with knowledge of the negotiations. Pension reform, labour deregulation and the ever-incendiary topic of the primary surplus are on the table. Tsipras’s anti-austerity administration has argued that its creditors’ demands for a budget surplus higher than 1.5 per cemt will exacerbate the country’s economic death spiral. The IMF, wants Greece to achieve a 3 per cent budget surplus as a minimum requirement before releasing bailout funds. And therein lies the problem. Nikos Voutsis, the tough-talking interior minister, told a private television channel at the weekend that without a deal, Greece would not be able to pay pensions and public-sector wages at the end of May while also meeting its IMF loan obligations. He claimed a default was legitimate because Greece was being blackmailed by its creditors. So after four months of fruitless negotiations, both sides are waiting for the other to blink. 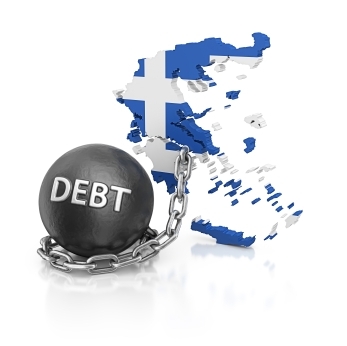 And for Greece, the stakes are high as it teeters on the edge of insolvency. But then, as the New York Times reports, Greece is already operating as a bankrupt state with universities, hospitals and municipalities struggling to provide basic services, and the country’s underfunded security apparatus losing its battle against an influx of illegal immigrants. This entry was posted on May 26, 2015 at 11:08 am and is filed under Uncategorized. You can follow any responses to this entry through the RSS 2.0 feed. You can leave a response, or trackback from your own site.